Bahia Principe San Juan Resort Review: Frequent guests of all inclusive resorts have come to trust the Bahia Prinicipe name for their Caribbean Vacations. 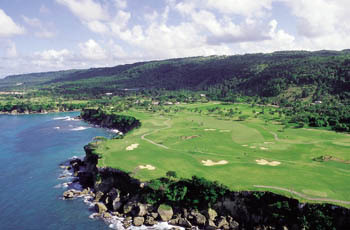 Bahia Principe San Juan is no exception, as it offers all you could want for the vacation of a lifetime. Set on 1.5 km of pristine white sand beach, Bahia Principe San Juan is only 60 minutes from the Peurto Plata International airport. As a large resort, Bahia Principe San Juan offers first class facilities, activities and amenities while maintaining the intimacy of a smaller resort by distributing the rooms throughout a large area in Villas that sit no further than 150 meters from the beach. Unwind by the pool, explore the local towns, exhilarate your senses on the beach, among the mangroves and tropical gardens and play in the surf at Bahia Principe San Juan. Find everything you are looking for at Bahia Principe San Juan. Bahia Principe San Juan Resort Review Accommodations: Of 941 Rooms, none are more than 150 meters from the beach, while some are as close as 20 meters from the beach. 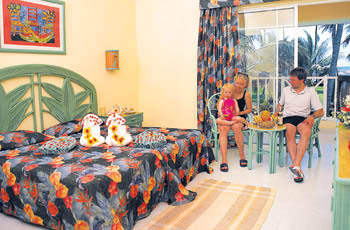 Rooms are located in Villas throughout the resort grounds, giving this relatively large resort an intimate atmosphere. Rooms at Bahia Principe San Juan are comfortable decorated with two full size beds or one King size bed. A private terrace or balcony lets you step out into the lush tropical setting and soak in paradise. Bahia Principe San Juan Resort Review Activities: Activities at Bahia Principe San Juan center on the fabulous facilities of the resort. At the center of the resort guests will find two lake-type swimming pools with children’s section and Jacuzzi. Large solariums with sun shades and loungers surround the pools to provide a relaxed and comfortable environment as you spend your days by the pool. Bahia Principe San Juan understands the value of their family customers so they provide a Mini-club for children. Professional and friendly staff put on shows and great activities throughout the night and day. Adults can take advantage of the water sports, tennis courts, putting green and full service gymnasium. Guests of Bahia Principe San Juan will always find something to suit their desire. 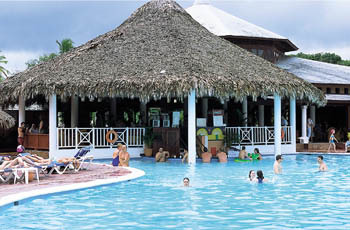 Bahia Principe San Juan Resort Review of Restaurants and Bars: Enjoy our facilities: two lake-type swimming pools with children's section, one of which has a Jacuzzi; an activity swimming pool and a swimming pool with children's section exclusively for Club Hacienda Príncipe guests. Large solariums with sun shades and loungers. Towel service at swimming pools and the beach. Mini-club for children. Salon-theatre, animation and night-time shows. Four tennis courts, basketball court and football pitch, Mini-Golf, Putting Green, water sports activity centre and a fully equipped gymnasium. Spa. Convention center. * Swim up pool Bar. Unlimited local drinks, beer and soft drinks in all bars of the Hotel until 23:00 pm. All local drinks at the Disco, "La Terraza" Bar, "Karaoke" Bar and at "Rock Café" of Pueblo Príncipe. The hotel offers the facilities of the "BAHÍA PRÍNCIPE SAN JUAN Mini-Club" for the enjoyment and healthy entertainment of children. The club has fully qualified staff responsible for entertaining children with various recreational and interactive activities to ensure they enjoy their holiday in a healthy and safe way. The Mini-Club is available to children aged between 4 and 12 years. Every night in the entertainment area, children will get the chance to enjoy and participate in a show created especially for them: DONALD DISCO, with dancing and contests that will delight these youngsters. Bahia Principe San Juan Resort Review location:Bahia Principe San Juan is located on the North Coast of the Dominican Republic, 70 km from Puerto Plata airport (60 minutes by car) and a comfortable distance from cities such as Cabarete and Sosúa and Puerto Plata. It was opened in July 1995 and is set on a 1.5 km private beach which is sheltered by a coral reef. It covers an area of over one and a half million square metres and is surrounded by lush tropical vegetation with mangrove swamps. It has number of tropical gardens which are the setting for little lanes along which guests can walk while enjoying the sea breeze and the freshness of the natural surroundings. From Puerto Plata airport, take the motorway to the left. 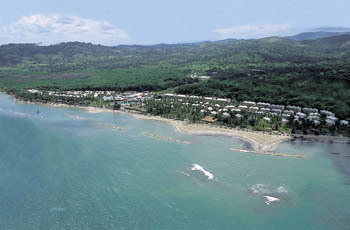 Go through Sosúa and Cabarete and on to Gaspar Hernández. From Santo Domingo airport, take the Duarte-San Francisco Marcoris. Anxious for your trip to Bahia Principe San Juan? Hit any of the "Get Quote" buttons on the page and we'll send you a booking confirmation form or give us a call toll-free and we'll answer any questions you may have. Let's make that dream vacation a reality - join the Punta Cana Information Guide Family. Do your own Bahia Principe San Juan Resort Review this season!